So...Pinned the width of the swatch is 14.25 inches and the height to the point is 7 inches. This is through the first repeat of 24 rows of the body chart. I had 14 stitches over 4 inches (knit on size 3 Addi Lace needles). Now. When I unpinned, here is what I had: 13.75 inches wide and 6.5 inches high. Hmm...Unpinned there was a "bounce-back factor" that was 1/2 an inch in each direction. I've seen that happen with natural merino, tho' I have to admit I didn't measure the difference. But 1/2 an inch doesn't seem unusual in my mind...what do you think? I'm really pleased with the results of this little test. I adore the pattern - isn't Anne's pattern just gorgeous? (ok...nothing she does is anything less than gorgeous, I know!). And I love The Meezer colorway. I think I'm going to continue on with this as is. I'll show that to you later in the week and see what I think of the "bounce-back" on that one! This is interesting...I can't wait to see what Judy finds in her results! That doesn't sound any more dramatic than bounce-back I've gotten from other yarns (except silk, which doesn't so much bounce, as stretch lengthwise beyond all expectation, while refusing to hold a widthwise block; or maybe that's just me). I'm so glad you're going to knit it in that yarn -- I love the way it's turning out! I think the bounce back is inevitable. 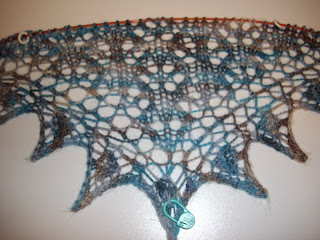 So, it seems like superwash is an okay option for lace knitting. It looks fabulous! I think the experiment was a success! It looks great and I do LOVE the color! Looking forward to seeing you at Sedalia Fiber Festival this weekend! Glad you're carrying on - it's lovely!